What exactly does this weapon provide? I ask because as of current I can't seem to play this weapon in any game mode, like at all. I love the traditional caster classes in my old games I would play when I was younger, and I love the thematic use of a staff wizard caster that uses all 4 elements, so staff is the perfect weapon in that regard. However, I would be told to choose a different class when I would fractal/ raid, and in wvw it's absolutely outclassed from other classes like scourge. While we do have meteor shower, it's pointless because the zerg would just wait out the meteor shower and go in, when you have classes like scourge who can cc you and damage you with an almost guarantee kill if you get knocked down. In pve it struggles as a solo open world weapon when you have other weapons that will provide you with more mobility, damage, and sustain then the staff could ever provide. Not good for group play, not good for single play, where does this weapon exactly fit in? In pve it struggles as a solo open world weapon when you have other weapons that will provide you with more mobility, damage, and sustain then the staff could ever provide. Just wanted to point out that those other weapons bring less mobility, damage and sustain than any other class. And staff manages to be worse than those. To answer your question, I guess you can use staff when running open world bosses and bounties, since you would get popped in a split second in melee for being the most squishy class there is, and that's on scenario where you could even thing of going melee (some bounties lock you at range during certain phases). It's also an option for tagging, since there isn't any other option really, even though the cast times and animations are absolutely horrible for tagging mobs before they get deleted. Specter does have long animations too so I guess staff is not a good option, just the least worse. It's used for range and AoE (meteor, lava font, fireball with splash) , swiftness + static field on air, immob on earth, and heals on water. I don't think anyone takes staff for the gust skill or ice spike. It's a large group weapon (ideally 15+) when you are fully supported with quickness and/or fury to make use of air traitline. The problem is meteor shower takes a long time to cast and you can't move or it cancels, lava font was nerfed so you need to have things stand in it, static field is really small now, the heal scaling on water attunement skills requires building around it. Also meteor does less damage each hit. The damage on staff hinges on meteor mostly after lava font nerfs, the fireball skill hits 3 targets and doesn't hit nearly as hard. It was semi-compensated with eruption's increased damage but in practice eruption and ice spike have delays. The moment dragon's tooth is faster on scepter, I think many more people will drop staff if they haven't already : the damage is quite high on it. Shatterstone has been buffed a lot but it's still slow similar to ice spike. Right now it's mostly tempests running fresh air that use scepter as air auto has cleave when overload is off cooldown (lightning strike hits one target and so does the slow fire auto). The problem with sword (weaver) or dagger is if it isn't a known encounter or if there's enemies on walls (i.e. urban battleground fractal or WvW keeps) you need to be able to use ranged damage. Elementalists don't have weaponswap so you need to get out of combat to swap into a ranged weapon. In fractals , reaper / chrono mesmer / mirage mesmer / scourge is stronger with instabilities due to boon rips and less cast time and higher survivability. As far as pure damage I think the average holosmith is higher than average elementalist , plus holosmith hits 5 targets with Photon Forge and bomb kit. Good to fill in the theme and description that elementalists favor range (only ranged option) and cast spells (that still deal lower damage than instant skills of other professions). and in wvw it's absolutely outclassed from other classes like scourge. While we do have meteor shower, it's pointless because the zerg would just wait out the meteor shower and go in, when you have classes like scourge who can cc you and damage you with an almost guarantee kill if you get knocked down. 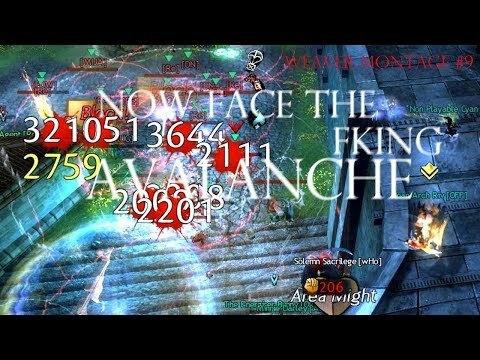 There is a way to play staff weaver in wvw, and many, many, many ways not to play it. The problem is that most people play it a few times, aren't very good at it, and then say other classes do it better. If your positioning is good you can survive longer than full ministrel firebrands who have to stay on tag -- with staff weaver you must become a professional squirrel, always choosing the optimal place to be casting from even if it means separating yourself from your zerg -- and then using lightning flash, burning retreat, or twist of fate, and sometimes all 3 combined, to get back onto tag when things get tough. Can't stress this enough - you HAVE to run lightning flash and twist of fate, AND use burning retreat defensively if you want this build to work in a variety of situations. I've been playing staff ele since beta. I think I know a little bit of how to play it, and yes it's quite apparent that using staff in wvw you absolutely MUST take lightning flash and twist of fate, and even with lightining flash and twist of fate they are basically baiting your cooldowns until you can no longer use metor shower in safety. making you absolutely useless once those important skills are on cooldown. It's not even so much about the dps, what matters is what you truly offer to your group other then just meteor shower, which is damage, however, can be totally negated if the commander on the other end is smart enough to work around your meteors, and your fields. Honestly I've heard this argument so many times and the fact that you started with "Yeah well I know what I'm doing, I've been _____ for ____" potentially shows why you said this. I've been in so many situations, many of which are documented very well in my growing number of weaver videos, where literally one meteor shower and FGS burst can destroy the opposing frontline. I've done this in tier 4, tier 3, tier 2, tier 1, vs good guilds, vs bad guilds, vs practically everyone. I have over 2000 hours of beating the hell out of people with ele in WvW. It works. It's not my intention to be rude at all and I want to express respect to you as a fellow weaver, and I do believe you when you suggest that you're competent enough to understand. But I have to state the facts. Staff weaver is devastating and it's essential to have at least one or two in a good group comp, why do you think [VR] runs a few? Because it literally wins fights. It's not as easily countered as you're saying, and I know this because I live it. If your experience is different - that's ok. But your experience has not been mine, nor my friends who fight alongside me and see the difference. It is ABSOLUTELY about the dps, and I don't let people bait my cooldowns. Or, if I absolutely need to utilize all 3, I stick very close to tag where the stability/heals are for 10 seconds and I've got burning retreat back in my arsenal. Sometimes I'll even fake a burningR-meteor shower combo and cancel it before casting to trick the guild group ahead into moving the other direction, and then cast it that way. It's how you play, not what you play. If staff weaver isn't working for someone, it is ABSOLUTELY their own fault (with exceptions to very specific scenarios i.e. your guard/group comp gets rekt and the entire squad wipes, etc .. things that can't be avoided). also I re-read this and it seemed a bit aggressive, sorry I genuinely don't mean to be. Staff is ele's all-purpose weapon (damage, cc, mobility, heals) . It can essentially do everything except condi damage. It only excels in wvw zergs, but it can be pretty strong in all parts of pve as well where you need range/aoe cleave. 3) you're supposed to position MS to break their movement by either damaging half of them or zoning them in your team's bomb. It's only easy to avoid if enemy is running a small group which makes it easier to move quickly out of aoes, but in those situations you just wait for them to revive someone or your team to stun lock them aka you wait for them to get in combat and not move too fast (or force their movement with MS so your team can pressure them easier). It works just fine in pve, you have ranged damage and cc so sustain is not even needed. It has enough mobility and cc for kiting. It has the biggest aoe damage output among all ele weapons; it may be slow vs single targets, but when you group a few of them they melt under your aoes when you group them up. While it's not optimal in raids/fractals it's often very useful when group lacks aoe cleave for adds or needs some ranged clear (shards on Xera, orbs on Gorse or something similar). The problem with the staff is not landing stuff, it's mostly when comparing it to other equivalents of the same category. In WvW, you've got Rev's with the same range and are the best competitors to Weaver damage-wise and weaver is nothing support-wise facing a Herlad. A Herald can spam 2 all the time without popping a single utility skill and deal the same damage, leaving all utilities for the times of need. Staff, ToF and LF with BR in between is the bread and butter of the whole spec, remove one utility of these and you'll know how lacking the staff is, or have one of them under cd and you know how hard it is to adapt to the situation. That's the problem with the staff, or with ele in general, you give in everything for the same results, yes same results. No longer high risk for high reward, because if your reward is the same as someone that has it with lower risks, then it's no longer high for either of you. If there was an actual high reward then I wouldn't mind slotting every utility for mobility to achieve that high reward, but it's the same prize you get as others that can survive and provide as well as compete in the only thing you do, DPS. In PvE, its damage is probably now below Holos that are still a more preferable option than weavers by players, or even the DDs that can 1/1/1/1 all the time and still deal higher damage while you're at peak damage, or the current 7-chrono comps. Bear in mind that pulling off staff's rotation is not an easy task, even sword is a joke compared to it. And since sword exists, good luck using staff unless it's dead-need for it, but you'll still have got into the group because of the sword not because the staff. For OW, you can go full DPS with all damaging utilities and still get out of any situation unscathed. I love playing staff but what I hate is how the same level of reward is given to anyone that needn't all that work to pull off the same value. Yeah I love the complexity and pressing many button and would accept having someone do the same damage with less need of knowledge or complexity, but not to the extent that they can bash their head against one single button to do the equivalent of five. The weapon needs a rework or some adjusting to how long things take, how much the damage given out is; Lava Font was quite strong, now it's quite laughable. I believe even if you're a supporter of the current situation, you know it's lacking and there has to be some tweaks. Utilities shape the staff, they don't add a taste to the playstyle, they're the playstyle and they are obligated because the weapon can't carry its own. I'm using staff nowdays only for healing options (as healer tempest). And for me it's the only option for "main ranged weapon" choice for elementalist "who prefer ranged weapons". You can also - using staff - make other option: /dance and who knows... maybe your oponent will die of laughting. man that zoom in effect is painful. Staff is so 2012. But can still find its uses, but it is a very suboptimal weapon. The weapon has almost everything on it except mobility and condi damage, and yet achieves nothing by itself if not highly specialized. 1920x1080 23". nothing is getting cut off or anything like that, it just looks gross lol. I dunno why. but hey if youre doing it for phones then that makes sense so keep it up and don't mind me. guess ill be without some quality staff ele videos tho… ill have to watch rival videos... ill be sad... nah lol. I totally agree, its clearly out dated and out classed by every weapon we have access to. And is only viable for it's one signature skill- meteor shower, even then it's quite negligible except for wvw, and EVEN THEN doesn't excel as well if you don't have the group comp for it. I'm personally just have FGS slotted exactly for such encounters (after all, what else would you realistically slot as elite skill for Ele? Elementals, lol? Or that sad excuse for an elite, Tornado? And even for Tempest I would choose FGS without much thinking, as Rebound seems like extremely under-powered and very situational, for an elite skill, it's more like a regular shout skill). I also slot the Bow, to have a fallback range option when FGS is on cooldown. Btw, what that "tagging" is? Why would you want to "tag" mobs like that? Just curious. Staff is the most "direct magic" weapon from the ele and focused on large aoes. Its long range and focuses on powerful dps, cc and support (compared to other ele weapons). The key here is to use all attunements instead of sitting in one all the time. Staff has static field, frozen ground, shock wave, and unsteady ground , all of which are very long and large cc. You can use that cc form 1200 range to set up some pretty huge aoe dmging spells. From eruption, ice spike , meteor shower and lava font. Even your auto attacks have aoes. FIreball splashes on hit for dmg, water blast splash heals, and chain lightning bounces around. In pve all those aoes can be absolutely devastating on the mobs, specially during group events where you freely stand back and rain destruction on mobs in fornt of you while other players and npcs keep the mobs busy. In wvw, do not underestimate your cc, and even more so your water fields which can bring back the entire zerg back to full health if executed correctly. Your long range heavy dmg aoe "pulsating" damage is devastating to enemy sieges as well. And finally , never forget the power of red circles! . Even if you have 0 dps. When a group of enemies sees large red circles, or freking meteors raining down from the sky they will back off and run in another direction, and that kind of enemy movement control can be more powerful than any stun or cc! It's for styling on people in PvP. Sorry for the delay, I didn't notice earlier. Tagging is basically hitting many mobs while running with a zerg, such as when you're doing some parts of Istan farms, Dorik's leather, Silverwaste's RIBA or even Teq's defense phase. You're moving with a big group of people and you want to "tag" or hit the monsters once or a few times before they die, which happens pretty quickly when there's a group of 25+ people on them. Mirages, for example, have pretty good tagging capabilities with Split Surge (GS Ambush), as it is instantaneous and tags a few mobs around your target as well. Mantra of Pain behaves like that too. Elementalists are more limited in term of tagging. Most of their skills have a long cast time, animation or travel time, which means very often, mobs you target will be dead before you get a hit in. Scepter Air #1 and #2 are instant too but hit one mob, which is pretty meh. I guess Staff has Fire #2 which could be decent for tagging at range, as well as fresh air, some water skills, and Air #5. Fire #3 is pretty good too, but for whatever, probably bad, reason, you can't double attune to the same element quickly and reliably as a weaver, so you'll most likely never use it, or very little. Thanks, @Jeyzer.1605 , I see now. but for whatever, probably bad, reason, you can't double attune to the same element quickly and reliably as a weaver, so you'll most likely never use it, or very little. Well, technically you can, Unravel worked pretty well for me when I was playtesting d/d Weaver lately, you can access your basic weapon skills very quickly with it, just hit, say, Fire attune button normally, and then activate Unravel, you instantly will get get your basic Fire attun skills. But you must waste an utility slot to be able to do just that, what is a bummer, of course. Shame on you, Anet, for the squishiest e-spec which is pushed into melee range by design, do you really need to make its life even harder? Unravel MUST be a regular e-spec ability, accessible by F5, without need of slotting it. Staff has needed reworks since launch. Air, Earth, and Water are all way undertuned for damage for the utility provided, making them only viable in highly specialized situations. Fire is okay, but Staff tries too hard to force you to camp Fire when solo or in casual play, which IMO is a big problem with the weapon. It's the only mesmer-like playstyle in how it can exert huge control over large areas; without doing a lot directly, it can force players to move and think in certain ways. The only reason why this is underplayed is because PvE mobs that matter have immunity to CC and everyone in PvP is constantly simmering in a smooth-brain stability bath. At least in PvE it was king DPS, but meme devs wanted to sell their PoF specs, so they explicitly nerfed the two skills which held that paradigm together (and that's only after they had nerfed things like the FGS charge line).